Because we think of the body as a whole and all the systems as interlinked, let’s discuss what happens after you get done eating and digesting. Yes, your assumptions are correct. We are going to talk about the big Number 2. As the old saying goes, “what goes up, must come down.” The same is true for eating, “what goes in, must come out.” Normally, your body simply takes care of everything automatically. But, if you are going too much or going to little, it becomes quite the problem. I am going to give you some real world advice on these two common problems, address their causes, and offer you some helpful solutions that will hopefully enable you to rectify the situation quickly. Let’s first start with some basic biology. When you eat food or drink liquids, they travel through your mouth and into your stomach. After your stomach, they travel into your intestines. Eventually, all of this ends up at the other side coming out as Number 1 or Number 2. This is your body’s way of eliminating waste and chemicals inside the body that have been converted. This is a super important function of your body. And if it doesn’t work correctly, it can cause all kinds of other back ups in the system. What’s really interesting about digestion is that it is one of the core functions of your body. And yet, many people will go their entire lives without actually giving it any thought until there is a problem. Some examples of this would be fibrous vegetables like carrots, celery, mustard greens, radishes, and so much more. All plant material contains fiber. Fiber, as we call it, is actually cellulose. Cellulose makes up the cell walls of plants. This cellulose is what gives plants their firm texture and hardness. The more cellulose a plant contains, the harder it becomes. This is the reason we can build houses out of wood. Humans can not properly digest cellulose. As a result, we call it indigestible fiber. This indigestible fiber is what pushes things along and acts like a binder for your food as it moves through your digestive track. The function of your lower intestine is to extract the water from your foods. If you’re missing out on some daily commotion, it’s a very good chance (especially if you are on chemotherapy) that your lower intestine as sucked all the water out of the food. This makes everything dry and painful. This also causes your waste to get stuck. The best solution I have found personally is good old fashioned, grandma approved, prune juice. I recommend drinking a glass or two. Give it some time to work its magic. Because when it works, IT WORKS! Prune juice is filled with all kinds of b vitamins, potassium, fiber, and a special naturally occurring chemical that will get things moving along fast. After the prune juice works it’s magic, I recommend drinking a small glass of it a day to help with hydration and to continue to keep things moving. Going too much, can cause rapid dehydration. This is an incredibly serious health problem. Don’t just drink water. Water is actually not a very effective hydrater. Consider sports drinks, fruit juices, and cups of broth to keep your loved one hydrated. The additional salt found in these 3 items will help maintain the moisture in your body. It may seem like the solution to both of these problems are identical. But, we are using them for different reasons. If you are going too much, increasing your fiber can help push out whatever it is your body is rejecting in the first place. This helps you to “dry up” faster. When my mom had this problem, Imodium really helped. I would recommend it as long as your doctor says that it is OK for you to use. I never thought I would be talking about the other end of business inside of a cookbook. But with cancer patients, there are unique challenges. This, unfortunately, is one of them. Plus, I guess I am kind of the hero here because I have saved you from going into an online forum and having to ask these questions. Now you have solutions in the privacy and comfort of your own home and have maintained your dignity at the same time. Read the article here: Is Cancer Affecting Your Constipation? 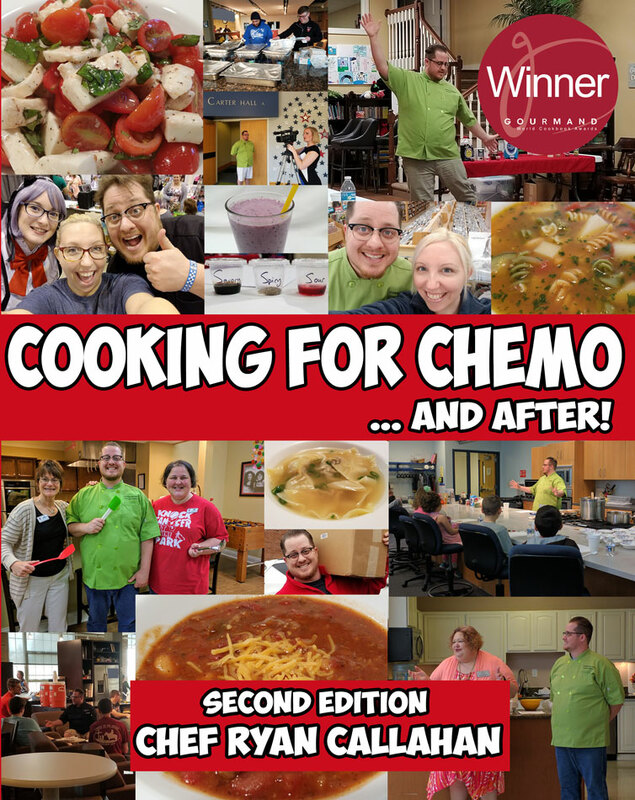 You can purchase Cooking for Kids with Cancer by going to Amazon or Barnes and Noble.